Columbia River Salmon fishing guide, Kevin Newell welcomes you to join him on a great Columbia River Spring Chinook trip! Learn the best methods in the best locations! Tech Tip #1 - "Where do I fish?" This is one of the main hurdles that anglers of all experience levels must be able to answer. Where do I fish on the Columbia River for Spring Chinook? This article addresses the basics of this. Anglers obviously want to go where the fishing is going to be best and since our Spring Chinook tend to move fairly fast on their journey upriver the best location for one 2 or 3 day period may be a total waste of time a week later. So answering this question isn't always easy especially considering the huge number of variables that exist in this fishery. Fortunately for anglers on the Columbia River there is data available from ODFW/WDFW that provides the information taken from the Creel Surveys that are performed weekly. After years of fishing on the Columbia River for Chinook Salmon and Sturgeon and religiously reading the creel survey data I have been able to determine the two go-to spots on the lower Columbia River from Bonneville Dam to the river's mouth near Astoria. Specifically these are the section of river from the I-205 Bridge downstream to the mouth of the Willamette River and the second section is generally known as the Clifton Channel which is near Cathlamet, WA. The map below shows these areas. Both of these areas can produce extremely well but I have found Area #1 in Portland/Vancouver to be the best all around springer location year in and year out, with Area #2 being second best depending on run timing, fish holding patterns, and water conditions. If you take the time to search through the creel surveys you can come to this same conclusion but it may just be easier to take my word for it. What makes these two areas produce so well? The reason these two locations are so great is because they are “holding areas”. Holding areas are sections of a river where fish will tend to slow their upstream migration or stop moving altogether. Depending on a variety of factors Spring Chinook may stay in these areas from a few extra hours to a few extra weeks. Since the Chinook are in a holding pattern in these locations, their strong urge to quickly migrate upstream is subdued, this allows them to return back to their basic nature which is to bite anything that gets in front of them! When fish are blasting up-stream, it is very difficult to stay on them, and it can be extremely difficult to get them to bite well if at all. These specific areas that I am talking about are easy to fish. What good does it do a fisherman to have a great holding area if it can’t be fished? Areas that are too small, too snaggy, or that have huge variations in bottom depth, can also hold Columbia River Spring Chinook but unfortunately they are extremely difficult to fish effectively. 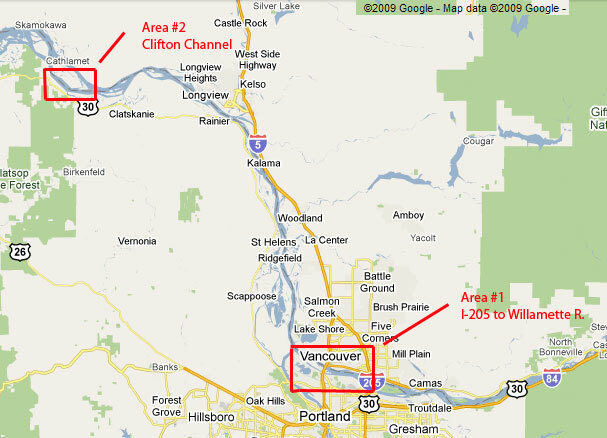 The Clifton Channel and the I-5 to I-205 sections of the Columbia are productive and easy sections of river to fish. A section of river that is large enough to hold a lot of boats but not get too crowded. Has a relatively consistent bottom. This is not to say that the bottom doesn’t vary, it just means that the variations are few enough or gradual enough to make it still fishable. Doesn’t have a lot of tackle eating snags. "So it’s easy to fish … big deal, what does that mean for me?" It means that you can consistently duplicate the method that you are using to successfully catch the fish! Let’s say for example that you have found that you have to be trolling at 1.2mph downstream, keeping your bait close to the bottom, then dropping your bait into deeper water, while at the same time angling your boat from mid river toward the north shore halfway through the pass (a pass is one complete troll through the area you are fishing). This example is the method that you have found works really well in the area you are fishing in on this particular day, and every time you are able to successfully repeat this you are catching a fish! However you are about to scream because you are only able to duplicate this perfectly one out of every 4 or 5 passes down the river. This is a small area with snags and quite a few other boaters going the wrong direction making things really difficult. So all said and done you only caught 3 fish today, but if you had been in an area that had more of the “Easy to Fish” criteria listed above, you just know that you would have limited out! My point is this, you should be making it your number one goal to spend your fishing time in areas where you are able to be productive and that also hold salmon. Areas #1 and #2 are perfect examples of this. Being productive means creating a fishing system that you can consistently duplicate. Consistency, duplication and attention to detail are the absolute keys to success when you are fishing on the Columbia River. The faster you can repeat your successful technique, then the more Spring Chinook you are going to catch! I have always told the folks in my boat that I consider myself to be the Ray Kroc (founder of McDonald’s) of fishing guides. Ray Kroc was famous for being able to consistently produce his product over and over again, and teach just about anyone the assembly line method for making the McBurger! Ray Kroc removed the variables and the hindrances to the successful creation of burgers. This is what I do every day on the river. The secret to my success is being able to duplicate what catches fish over and over and teach anyone how to work my system. Part of my system is that I don’t waste time in areas that don’t hold salmon. I also don't waste time in areas that aren't easy for me to fish. I have to produce fish for my clients and I have to be able to do it day in and day out. One of the ways that I do this is by being able to successfully repeat what works with the least amount of frustration. Less frustration means that the angler can focus on the details of what is required. It all boils down to this, easy fishing equals consistently higher success. Keep in mind easy fishing does not mean that it is actually easy; it just means that there aren’t as many outside hindrances to your success. Being able to successfully repeat your fishing technique over and over can be very difficult but it is even more difficult or impossible when you have too many other things that aren’t under your control working against you. Really it boils down to how much you value your time and what you are looking for in your day of fishing. Fishing is what I do for a living and I expect it to be work, so driving to where the best fishing is happening is what I do. I can also see the flip side of this. Many people pursue fishing as a relaxation sport and expending extra effort to go fishing doesn’t necessarily go along with the relaxation concept. Personally, when I’m catching a ton of fish, I’m having fun and this is relaxing because I know I’m being effective and accomplishing my goal. If you want to be a consistently succesful Spring Chinook angler then you sometimes need to get out of your comfort zone and spend a little extra time driving and a few extra dollars in gas to get to that new area where you just might find that you have actually been doing it right all of these years but you have just been fishing where the fish aren’t! When you are in the middle of a lot of fish it is amazing how much of a better salmon fisherman you can be! Go here for Spring Chinook Fishing Tech Tip #2 "What is the best technique?" © Copyright 2011 Total Fisherman Guide Service - All Rights Reserved.